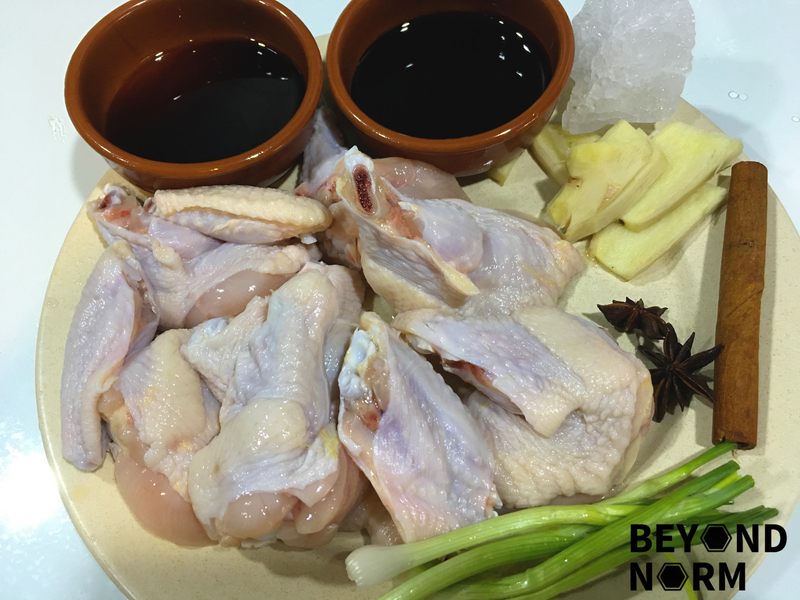 I was first introduced to soy sauce chicken wings by my friend who loved this dish. Whenever I was in Kuala Lumpur, we will go to this café; Hui Lau Shan (許留山), and without fail, she will order this dish. The wings were infused with the aromatically sweet, savoury, sticky coating of red-ish soy sauce with a subtle hint of spice and ginger. This dish is a classic and popular dish in Hong Kong and is known as Swiss Chicken Wings (or Sweet Chicken Wings). Mind you, this dish has nothing to do with Swiss cuisine but has an interesting story behind it. The story goes like this, there was a Western customer who went into a restaurant and was asking about the chicken wings on the menu. The Chinese waiter that served him was poor in the English language and tried to explain that it came with a ‘ sweet sauce ‘. The Westerner mistook that as ‘ Swiss sauce ” and as it sounded familiar, he decided to order it. Hence, the name of Swiss Wings (in Chinese: 瑞士雞翼) has been used and circulated around since then. If you like this recipe, be generous and give us some feedback/comments via our blog. We would also like to welcome you to join our Mummy’s Kitchen Facebook Group for food lovers like you, whether newbie or veteran. You can like us on Beyond Norm’s Facebook Page and subscribe to our blog. Follow us on Instagram and YouTube, @beyondnormblog, to get the latest exciting updates and videos. Clean and wash the chicken wings. 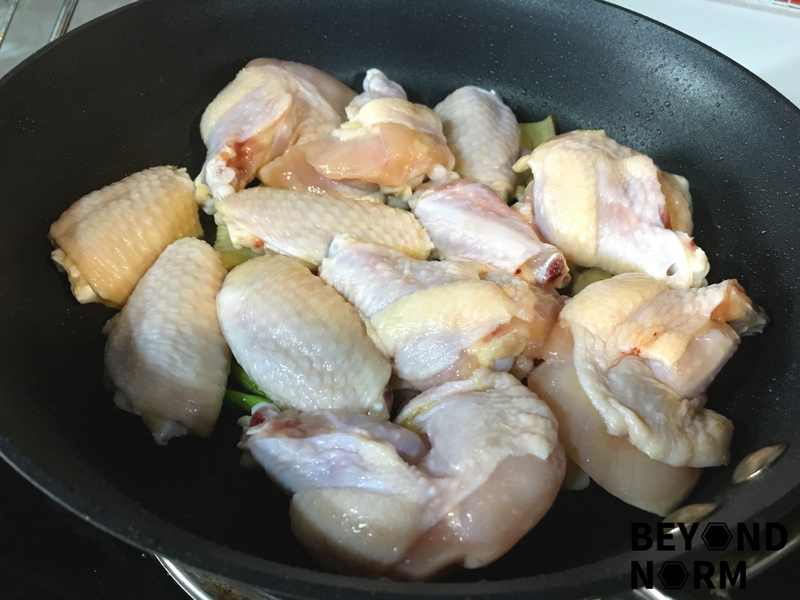 Cut the chicken wings into sections. Then set aside. Heat pan/wok till hot on medium heat. Then pour in the oil and give it a swirl. Add in the garlic, ginger and spring onions. Stir fry till fragrant. Add in the chicken wings, stirring immediately to coat with the oil. Add more oil if necessary. Stir fry, turning constantly, for about 3-4 minutes until the wings are a light gold colour. 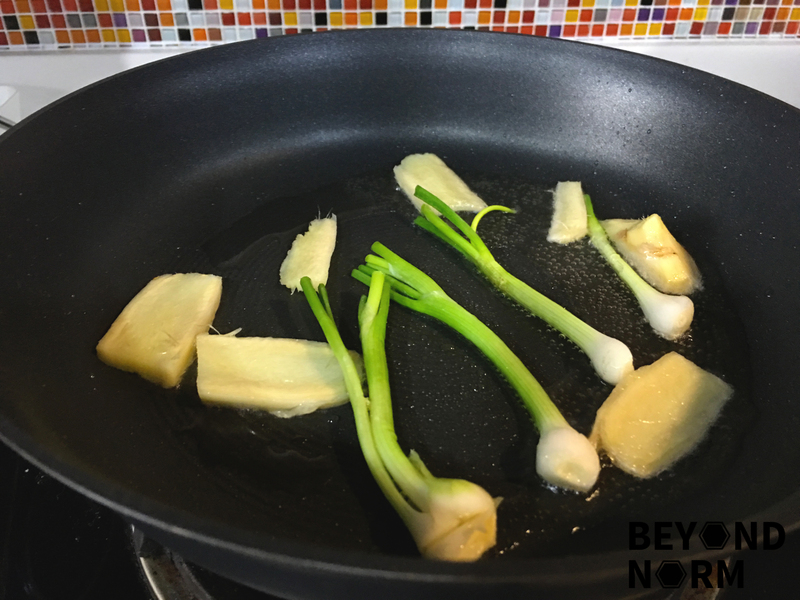 Make sure that the skins don’t stick to the pan/wok. 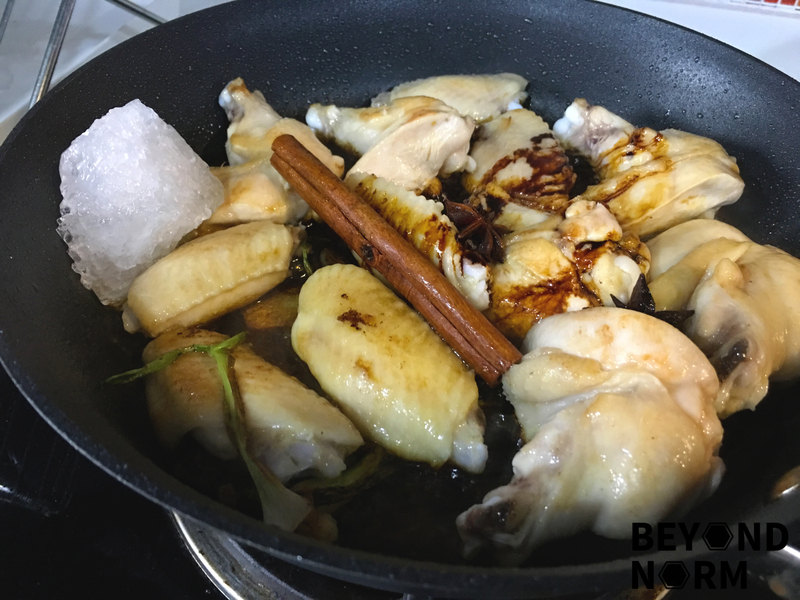 Pan-fry the chicken wings, light and dark soy sauce, rock sugar, and star anise. Then add the chicken stock/water till it barely covers the chicken. Bring it to a boil. Turn heat to low and cover. Simmer for 20 minutes, stirring occasionally to prevent the bottom wings from sticking to wok. Transfer the wings to a serving plate and pour the remaining sauce over them. Serve immediately with hot steamed rice. You can remove the tips of the chicken wings and place them in a Ziploc bag. Store them in the freezer till you are ready to make your stock. The rock sugar will give the chicken a glossy look. If you enjoyed this video, don’t forget to subscribe to our YouTube Channel so that you get notified when the next episode comes out!